Dr Lim Lee Hooi is a Consultant in Cataract and Comprehensive Ophthalmology and she subspecialises in the field of Eyelid, Lacrimal, Orbit and Reconstructive Surgery. Born in Malaysia, she was awarded the ASEAN scholarship in 1990 and 1992 to study in Singapore. An old girl of Raffles Girls’ Secondary School and Raffles Junior College, she went on to complete her medical studies in the University of Melbourne in 1999. Upon graduation, she returned to Singapore for her internship and training in Ophthalmology. She obtained her Masters in Medicine - Ophthalmology (M.Med) from NUS in 2005 and was admitted as a fellow of the Royal College of Surgeons of Edinburgh (FRCSEd) in 2009. She joined the Academy of Medicine, Singapore (FAMS) in 2013. In 2008, she was awarded the Ministry of Health Scholarship for her training in Ophthalmology. She completed her fellowship on Eyelid, Lacrimal, Orbit and Reconstructive Surgery with Professor Don Kikkawa and Professor Bobby Korm at the University of California, San Diego in 2012. Upon returning from fellowship, she is a keen educationist and was involved in the teaching of residents in Ophthalmology. She was part of the Core Faculty of the Residency Programme in Singapore National Eye Centre and was an Adjunct Assistant Professor with the National University of Singapore and Duke-NUS Postgraduate School of Medicine. She still returns to Singapore National Eye Centre and KK Children’s and Women’s Hospital as a Visiting Consultant. 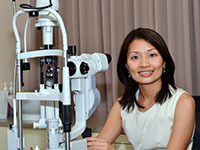 She is also the current Treasurer of the Singapore Society of Ophthalmology. Dr Lim enjoys the outdoors and staying active. She captained the canoeing team of Raffles Junior College in her school days. Now married with two children, she dedicates her free time to her children and shares the joy of growing up with them.